I suppose it had to happen at some point and we've beaten them before, so to draw AC Milan in the last 16 of the Champions League shouldn't be daunting for us. To be honest I'm really looking forward to this tie. We know in the past we've beaten big teams whilst slipping up against those we really should be beating. This time round we couldn't get drawn with Barcelona at this stage of the competition, but a trip to Italy in February following a return leg at the Grove in March doesn't look too bad. Rather that than going to Russia. Before sitting down to enjoy Christmas lunch with his players at the training ground, the manager and his staff learnt of the draw. "It is a difficult draw but an exciting one. And they could say exactly the same thing. It is a 50-50 match. "We have good memories at San Siro. Ideally, it is a draw for one round later but you take them when they happen." Of course we've beaten the Serie A giants in 2008 and never lost in a knockout competition against Italian opposition. This also gives Jack Wilshere something to set his sights on, in his battle to return from injury. The manager gave an update over the midfielder's fitness at his press conference yesterday. "He had a very important scan on Thursday and that was very, very good, exceptionally good. The news we have for Jack is very positive. "No [he will not be back sooner], we will respect the delays. I count maybe mid-February for Jack." Now I believe that Wilshere has had a set back. He was originally scheduled to play first team football again in January. Now it's a month later. It could be that the original time-scale was too ambitious and that's why the manager is now talking about mid-February. Even so, I think we have to ensure that Jack is fully fit before he becomes involved in football again. We don't want him out for even longer. The manager was quizzed about our interest in Cologne striker Lukas Podolski, saying there was no truth in the speculation that we're after him. However you can't believe what Wenger says on transfers to the media. We have first hand experience in the last transfer window where he said he wasn't interested in Mikel Arteta only to sign him three days later. I'm told that Podolski is a player Wenger is very much interested in. And something I've been convinced about for a long time is that we'd re-sign Thierry Henry next month on a short term loan deal, just to get us by whilst Gervinho and Marouane Chamakh are at the African Cup of Nations. It's something the manager is coming round to. "I haven't even investigated that. I cannot tell you even if there is a chance because I haven't even made any approach, not to him nor his club. "I do not always master all my thoughts so it has to come through my brain at some stage but I haven't been concrete on the case." So from a stance last weekend that Henry wouldn't be joining us, to this now. It seems that Arsene has seen something in training that tells him our record goal scorer could provide him with back up for Robin van Persie whilst the African players are away. There is speculation in The Sun that Robin is being targeted by Manchester City to become the fifth Arsenal player to move to the north west since the new regime brought the club. They expect a £30m offer to be made for the player in the summer. 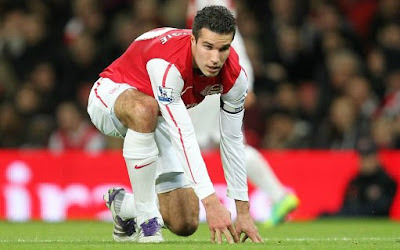 To be honest it's far too early to be concerned about whether Robin is staying or going. He's not talking to the club about a new contract but is happy and loving being captain. I'm not going to start worrying now about something that might only become an issue next summer. Robin has been talking about his form and how he's been able to keep fit. It's down to the GPS technology the club have been using - you know the silly looking bras the players have been wearing underneath their shirts. The early team news is that we've got the same squad available for tomorrow's game with Manchester City as we did for last weekend against Everton. Kieran Gibbs is likely to return against Aston Villa or Wolves. Whilst there was bad news on Carl Jenkinson who is out for another four weeks. If you'd like some extra reading, Matt Law at the Daily Express profiles Wojciech Szczesny and Joe Hart ahead of the big game. While Amy Lawrence of the Guardian looks at Arsene Wenger's change in philosophy following the sales of Samir Nasri and Cesc Fabregas. There is advance warning in The Sun that the Boxing Day game with Wolves could be postponed because of a planned strike by London Underground workers. More news on whether the game will go ahead early next week.